The last of the Nicaraguan projects we arrive at Romeo 6 project in Los Apantes, Miraflor but it proves a road too far. 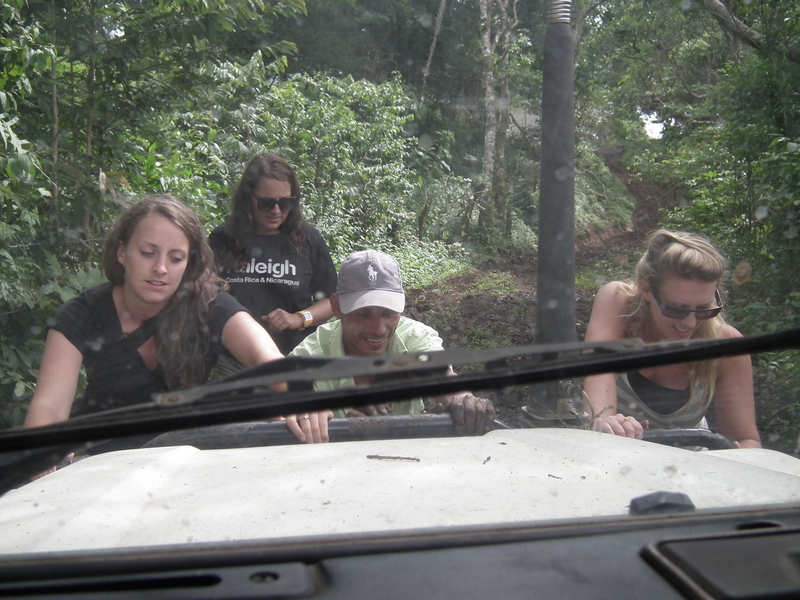 We are quickly stuck down a narrow track, thick sticky mud with nowhere to turn. Next hour spent digging Bravo 1 out, inch by inch – new skill for CV… slip sliding reversing up a steep hill in thick mud almost half way up the wheel hub. On the plus side I am nice and clean at the steering wheel (lol), but the girls outside with a local guy who does a brilliant job digging us out. Girls get well and truly sprayed with thick mud and lose shoes sucked off their feet into mud. Emily gives me the look of death at request to avoid messing my bag with mud when she eventually climbs back in, but we are free just in time before more rain starts. We meet the project team arriving 5 minutes too late to help push us free.